The Prologue Avant has an elegant, angular design. 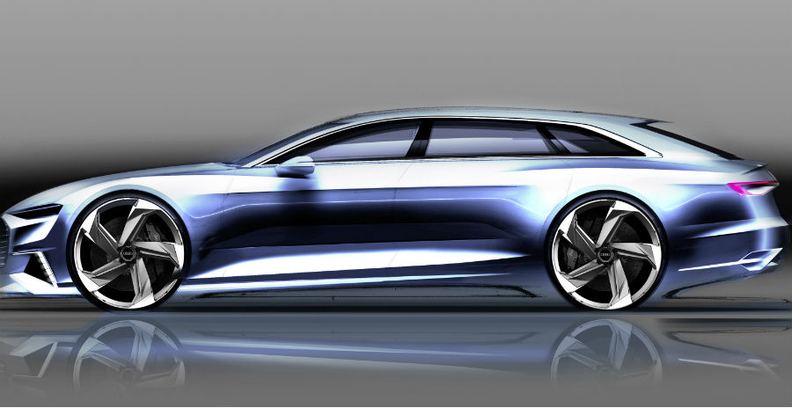 FRANKFURT -- Audi has released sketches of the Prologue Avant station wagon concept that will debut at the upcoming Geneva auto show. Media reports said the concept could preview a rival to the Mercedes-Benz CLS Shooting Brake. The Prologue Avant four-door wagon follows the unveiling of the Prologue coupe at the Los Angeles auto show in November. Audi design boss Marc Lichte said at the LA show that the Prologue embodies the future styling of the brand's A6, A7 and A8 sedans. The Prologue Avant's stretched body and low roofline preview design cues for future Audi wagons. Audi declined to disclose information about the Prologue Avant except to say that design details from the concept will be used on the next A6 and A7 wagons. The concept will be unveiled on March 2 on the eve of the Geneva show, an Audi spokesperson told Automotive News Europe.